On Tuesday, October 31, 2017, the Commercial Drive Business Society is holding a public Halloween event. FREE, SAFE, FUN for the whole family! We invite you, your friends, your family, all Commercial Drive residents, and the entire Grandview-Woodland community to join us in celebrating ‘Halloween on The Drive 2017’. This event is brought to you in cooperation with local community sponsors, locally owned and operated Choices Markets, East Van Inc. Tattoo, and Famoso Pizzeria, on Commercial Drive. 4:30 pm to 6:00 pm: TRICK OR TREATING…at merchants along Commercial Drive, Venables Street, to 13th Avenue. 6:00 pm to 7:30 pm: KIDS FUN ZONE… Join the Commercial Drive Business Society at Grandview Park, for face-painting, balloon-twisting, caricatures, and our awesome photo booth. Also, be sure to enter the draw for your chance to WIN a prize pack from East Van Inc. Tattoo, valued at over $250.00! 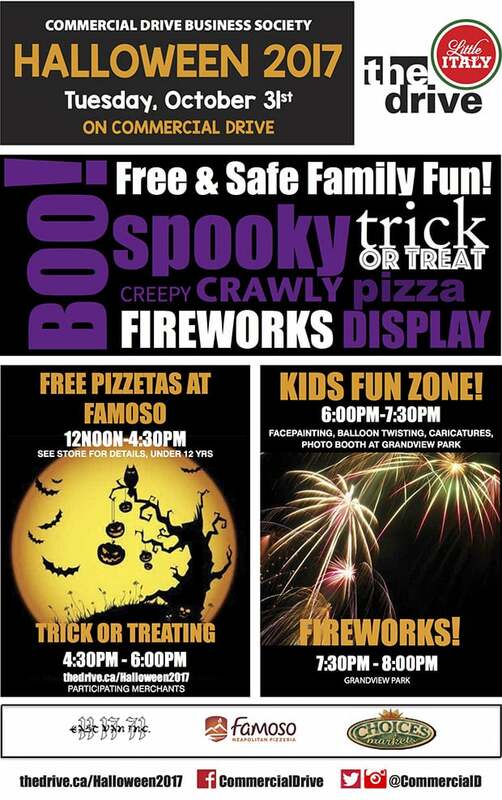 7:30 pm to 8:00 pm: FIREWORKS…finale at Grandview Park, with spooky Halloween music!